The mighty Williams racing team has produced many a GP car over the years. None, though, have had quite the allure of the FW14B. As soon as its designer Patrick Head picked up a pen, the world championship was done and dusted! But, there was another key ingredient. A certain Nigel Mansell did the driving! He was in sync with the FW14B to an uncanny degree. Are certain drivers born to squeeze into certain cockpits? Who knows! No-one else on the planet, however, was going to be winning the 1992 world driver's title. That is how far ahead of the field Mansell and the FW14B were! The key component in the FW14B package was 'active-ride' suspension. Lotus had already blazed a trail for the new set-up. Williams followed suit, in 1987. In '88, too, they continued their 'active-ride' mission. Patrick Head's faith, though, was shaken by reliability issues. Nothing daunted, Adrian Newey - Williams' chief aerodynamicist - had done enough wind tunnel testing, to be sure that 'active-ride' was still the way to go. The rationale behind it was to keep the FW14B uniformly upright - or, as close as possible, given the forces exerted on it! Newey badgered Head into giving active-ride one last chance - those reliability gremlins, notwithstanding. Come 1991, and the system was duly slotted into the Williams FW14 chassis. The motor racing gods were smiling ... this time, everything gelled! When the FW14's successor - the FW14B - was first dropped off the blocks, it hit the ground running. Actually, that's a bit of an understatement ... for a car which won its first five races! 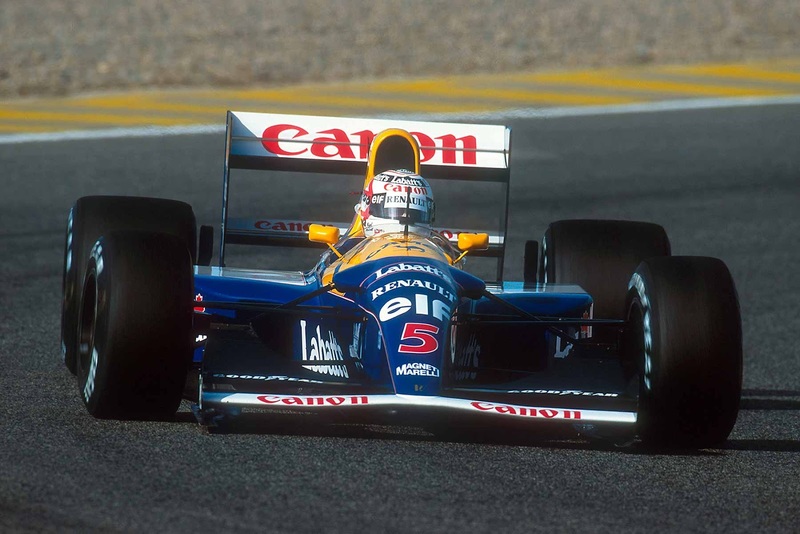 Four more victories duly followed for Mansell - as he grabbed the '92 season by the scruff of its neck! There were a mere two outings at which he and the Williams did not start from pole. The car's Renault V10 engine performed perfectly - while using far less fuel than its rival, the McLaren Honda V12. There was simply nowhere for the opposition to hide! With the FW14B, Williams had all bases covered ... and then some! Even the paint scheme outshone its competitors! With those bold primary colours careening round circuits, spectators were treated to a rich visual feast. Of course, that iconic livery will be forever associated with the great Nigel Mansell! A pundit was once asked - who was the most determined F1 driver he had ever met? 'Oh, that is easy', he said ... Nigel Mansell would have driven a car through a brick wall to get something done! But, with the FW14B, he did not have to do that. In that respect, at least, Patrick Head and Adrian Newey had made his life easy! One of the most iconic cars ever to lap a race-track, the Williams FW14B was miles ahead of its nearest rival. Which is always something that makes an F1 driver very happy ... even Nigel Mansell!